The first state to ratify the Constitution of the United States was Delaware; it's the second smallest state, and has only four yarn stores. And, despite my extensive searching, it didn't have any people dyeing and selling yarn in the state. I looked through all the local forums on Ravelry (from which I had found a few retired dyers), searched through yarn listings in the local yarn stores, and found nothing. Except, that the University of Delaware has an agriculture program that makes wool yarn and blankets from their flock of Dorset sheep. For more information on their neat program, you can click here. Their yarn was in worsted weight, and I was ready to settle on my first pair of socks resembling cushy slippers. After a few weeks of researching, I decided to send a few emails as a last-ditch effort. I emailed each of the yarn stores and a farm in Delaware to find out if they knew of any local dyers. 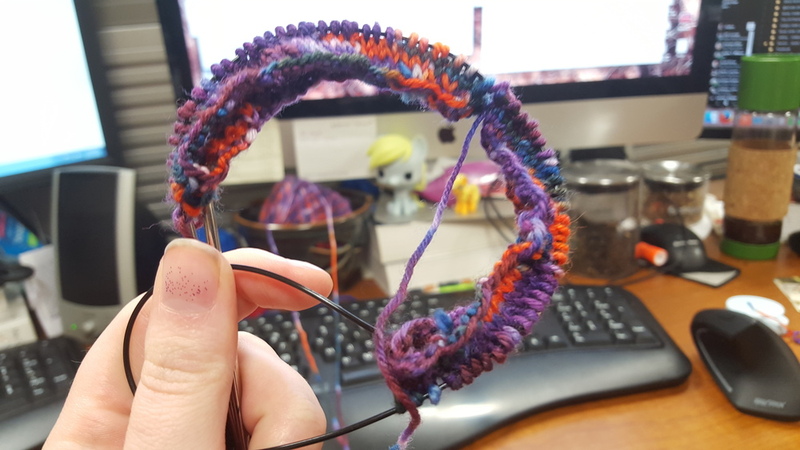 One emailed me back to let me know they forwarded my question on to a local fiber guild, and that someone should be contacting me soon. I waited. And, sure enough, a new dyer emailed me. They were preparing to have their online shop up and ready in a week or two, and I patiently waited so I could be their first customer. The business is called Ewe-Nited States of Fiber, and they are owned by a veteran. Most of their colors are one of a kind skeins, which is always special. I ordered the colorway "Purple Warp". 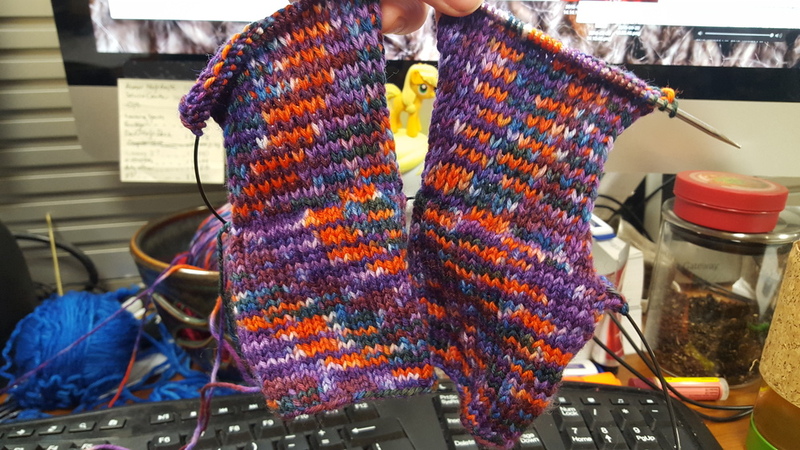 This was my first pair of two-at-a-time socks, and I think it's the only way I'm going to make socks in the future. 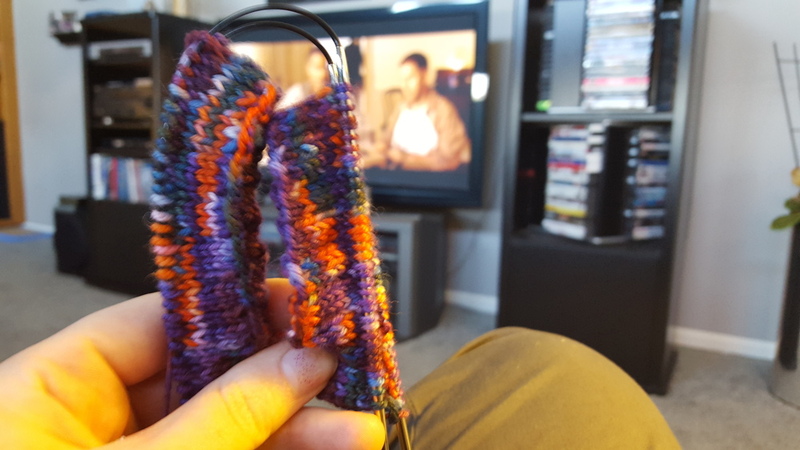 It elleviates the tendancy for "second sock syndrom", and it was not nearly as intimidating as it looks. 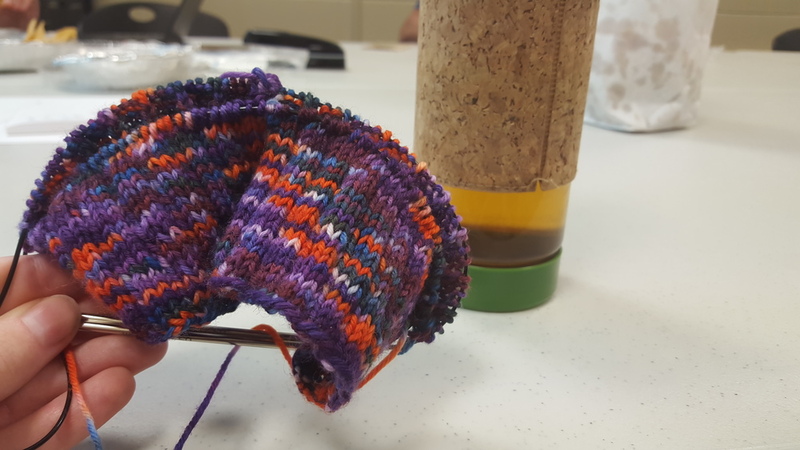 The yarn is pleasant, and the frequent color changes made the yarn fun to look at.